We met a new friend last Sunday. Judy from our church — Acts 2 United Methodist Church — stopped by to give Jenny a gift. Before Sunday, we did not know Judy. We actually recognized her immediately as someone we often saw at church services (especially before Acts 2 began offering a third service on Sunday — an early one; I don’t think Jenny likes getting going as early as Judy on Sundays). We recognized her as a friendly face, but we didn’t know her. But that didn’t stop Judy from going well out of her way to get to know us. Judy called Jenny and wanted to talk to her about surviving cancer. She didn’t sugar coat anything, but she did make it clear that you can have good times in your life even while undergoing treatment. Judy is a survivor — first leukemia, then breast cancer. She told the story of how her husband had bought her a stuffed bear as she began treatment years ago. She brought the bear and let us hold it. It was heavy. That’s what happens when you attach dozens of metal items to a stuffed bear. Judy told about how her friends and family offered pins, key chains and other assorted items that she could pin, glue, sew or otherwise attach to the bear. As she went through the four years of treatment with leukemia, and then — years later — the year of treatment with breast cancer, she kept the bear with her. The attached items helped remind her of all the people praying for her from all aspects of her life and from all around the world. It’s not a Teddy Bear. It’s better. It’s a Pillow Pet. (Words cannot describe how excited Brynlee is about this development). Jenny is excited, as well. She likes the idea and plans on using it just as Judy described. So she could use your help. 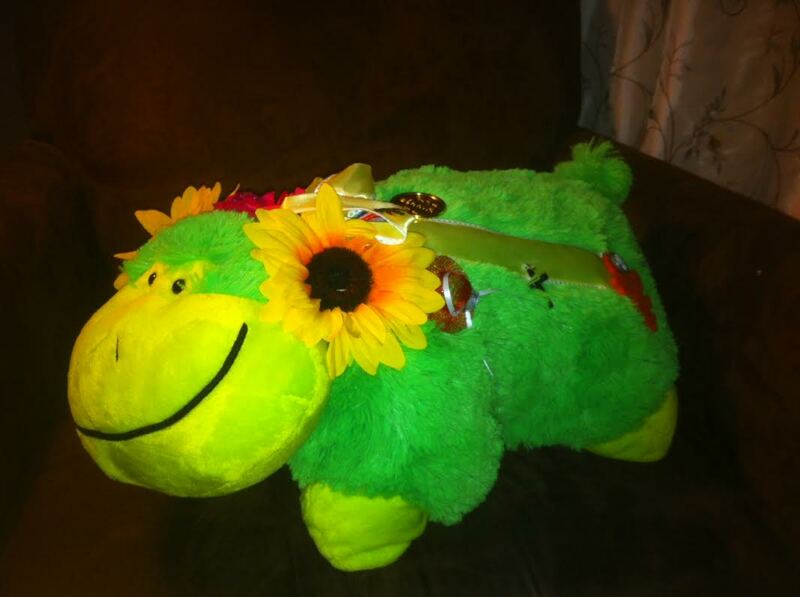 If you would like, we’d love to attach items to our new pillow pet. A pin, key chain or something similar that’s meaningful to you, Jenny or both — or it could just be something that looks nice. As Judy says, each attached item represents a prayer. We already know there are lots of people praying for Jenny. That feels really good to our entire family. The visual reminders and the soft pillow pet feel really good, too. P.S. — if you want to mail it to us, that would accomplish two things. (1) It would successfully deliver the item to us; and (2) it would give me reason to walk to our mailbox and allow me to rethink my plan to cancel my mail, thereby avoiding an interrogation from the postmaster general. This entry was posted in Other Random Thoughts by Alan. Bookmark the permalink. While this news was unexpected, how fortunate to have a friend like Judy — and many others who care. You can definitely count on prayers from the Williams household!